Delphi Academy recognizes the need for greater international and intercultural understanding and cooperation and welcomes the enrollment of international students. These students provide the entire student body with unique educational opportunities and an international perspective. 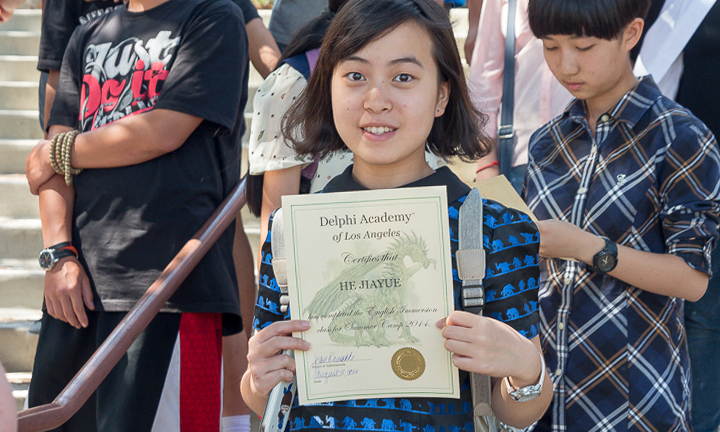 In return, these students receive an education in a stimulating and nurturing environment, which “instills the highest standards of character and citizenship and a commitment to academic, artistic, and athletic excellence.” At Delphi Academy of Los Angeles, our students develop the skills they will need to succeed in American colleges and universities and in life beyond academia. Applications for the 2017-2018 school year may be accepted after the deadline if any seats remain available. Applications for the summer camp program may be accepted at any time, as long as there is space available. Large groups interested in summer camp enrollment should apply at least 2 months in advance. Large groups will have to make their own arrangements for host families or local housing. To be considered for the fall term, students must have an advanced level of English literacy in both written and spoken English. We do not require a written entrance exam (such as the HSPT), but applicants do need to pass a Skype interview. They also need to have excellent grades from their current school in their native language and very good letters of recommendation from three teachers. The purpose of the Delphi Academy English Immersion Program is to help our international students become competitive with American students in their pursuit of an American education. We do this by providing a well-rounded educational environment which immerses the foreign student in American culture, social activities, elective classes, and basic English reading, writing, and conversation. An international student starting the English Immersion Program would be placed in the same class as a native English-speaking students, and will therefore be surrounded by the English language and American culture. Years of experience have shown that it is not efficient to attempt to study other subjects in English before becoming proficient in the language. Students who have completed the Delphi Academy English Immersion Program have appreciated being allowed to develop competence and confidence in English before going on to more challenging studies. The Delphi Program is based on development of competence, not the amount of time the student has attended the school. Our students learn to apply what they have studied. They accomplish this by learning an effective study method and by reading, writing and speaking English in large volume. The school uses the comprehensive educational philosophy of L. Ron Hubbard as our foundation. Mr. Hubbard identified barriers to study that people can encounter when trying to learn something new, but more importantly, he developed methods to overcome these barriers which any person can apply. With these methods our students learn how to recognize and resolve problems in study, in comprehension and in application. The first step in the program is a course in effective study, which improves the student’s speed of study and ability to concentrate. This course requires a specific vocabulary level, so an international student may spend the first few weeks or months studying a series of vocabulary building reading, writing and conversation courses in order to prepare him for the study course. Once the student has done the course in effective study, he is increasingly able to learn new vocabulary words rapidly and independently for use in his English communications. Students become masters of dictionary use. They also become accustomed to full understanding of the materials studied, rather than trying to simply memorize their subjects and then forgetting much of what they learned after the examination is taken. We usually find that this understanding leads to an increased enjoyment of study and often a more active pursuit of education. Students are expected to use the study method throughout their education, and by regular practice and occasional restudy assignments, become better and better at study. The study method is a tool, which can give students a competitive edge in their education. Delphi students do not study in a traditional lecture-style classroom. Instead they work from a “checksheet”—a step-by-step study guide that enables the student to study each step to full understanding and at his own rate of speed. Such a system prevents students from becoming bored, from waiting for slower students or from falling behind the rest of the class. Each checksheet step is fully mastered before the student moves on to the next one. Their teachers supervise the student’s study; they do not work with the whole class at once and do not lecture students. The teacher regularly works with each student to ensure a full grasp of the materials and often spends individual time with students who need help. At the end of the course an examination is given and any part of the course not fully understood is studied again to full understanding. 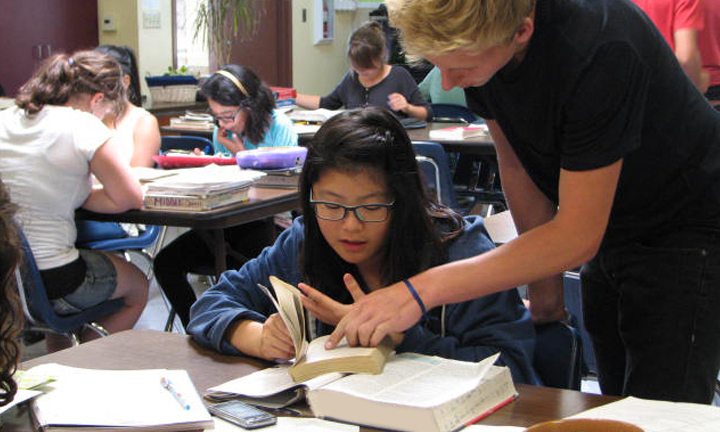 The core of the English Immersion Program is an extensive reading program in which the student reads large quantities of increasingly difficult material. Usually there are between one and three new vocabulary words or concepts on a page, which the student thoroughly learns before continuing on. The books on the program have been carefully chosen and supply a general education in American (and world) culture, history, biography, fiction and applied science, so that the student builds a vocabulary in a broad range of subjects. Through this reading program an international student acquires a wide understanding of the world of English-speakers, and builds a solid foundation for further American education. The international student also studies a series of grammar, communication and writing courses to learn the mechanics of written English. Part of every day is then devoted to the practice of writing. Students write in volume about a wide variety of subjects. As the school term progresses, the student is held to higher and higher standards of accuracy. Science and geography courses are also available at the student’s level of English proficiency. These courses are popular as they build vocabulary and allow for practical application in the science laboratory. Extracurricular activities – including sports, art and music classes, and a wide variety of activities – are a key part of the EI Program because they provide opportunities for the student to experience life as an American student experiences it in the U.S. Most importantly they provide opportunities to speak English with Americans. The development of the student’s ability to speak English is determined largely by participation. How Long Does The English Immersion Program Take? The amount of time needed to complete the program depends on several factors, the most important being how hard the student works and the age of the student on admission to the school. Other factors include the amount of English the student knows when he arrives, the student’s inherent potential, and parental support and encouragement. A very young Elementary or Middle School student often has a shorter program, while the average High School student may be on the English Immersion program a full school year or more. In the first month of school the teacher works with each student to determine his individual program of study. Details of the program can be sent to parents, along with a targeted date of completion. Each week students are assigned a section of the program to complete. If the work is completed on time and is of adequate quality, then the student will stay “on target” for his completion date. If he does not complete that assignment, he will fall behind. Parents are informed several times during the year of their child’s progress and number of days ahead on the program (“plus days”) or number of days behind (“minus days”) and are encouraged to discuss them regularly with their child. Nightly homework will be required, and parents or local guardians are urged to establish a quite study area at home. A student’s success at learning to speak English is due in very large part to the amount of English spoken outside of the classroom. For this reason, school policy is that international students should speak English with few exceptions. At the beginning of the school year when most students are new, the rule is not as strict, but as the year goes on, the rule is more strictly enforced. Helping international students learn English is a group project. Delphi students are friendly and willing to help, and the school arranges many planned opportunities to speak English. International students are expected to take advantage of their environment and make their own opportunities to speak English. Parents and students receive a copy of the schedule for the school term, including vacation times. Students should not take additional days away from the school as it reduces the student’s chances of completing the program on schedule. A student who leaves early or arrives late after a scheduled vacation may miss important activities as well. If a student will be absent from the school other than during a regularly scheduled vacation, the school requests written notification from the parents. If a student wishes to transfer to another school, the teacher will assist by arranging for transcripts that include the student’s grades as well as appropriate letters of recommendation. We recommend that parents begin the application process no later than December for the following September. International students will work with many caring faculty. The student’s teacher is in charge of the student’s educational progress and is generally the person who communicates with parents regarding academic matters. By working from an individualized program, a Delphi student becomes increasingly responsible for his own education. An education should be preparation for life, not just cramming facts into young minds. As the path is not always smooth, other faculty often help as needed. Parents should not consider that their child is “in trouble” or “being punished” by receiving this assistance. The school views this help as an additional benefit to a Delphi education. Students may make poor choices that cause them trouble, such as not using their time well, not following classroom rules, studying carelessly, or breaking other school rules. When that happens, the Ethics Department is available for help in getting back on the right track. If the teacher finds that a student needs help from the Ethics Department, parents or local guardians are notified so that they can stay in close communication with the school and contribute as needed. It is important to the student’s progress that the school and parents are well coordinated. The student’s teacher is particularly interested in what parents want the school to know regarding their child’s education and progress. They will send informal reports via email on the student’s progress several times during the school term, in addition to the report cards. Parents who wish more frequent communication are encouraged to call or e-mail at any time. Report cards are sent to parents two times each school year: February and June. The purpose of the report cards is to keep parents informed of their child’s progress through the program and lists the courses and activities completed. Full transcripts and grades for use in application to other schools are available on request. The Delphi Academy English Immersion Program has provided a successful transition for many international students to American schools. With a dedicated and caring faculty and a proven program, students are set up to get the most from their American education. Welcome to Delphi Academy’s Summer Camp for International Students! 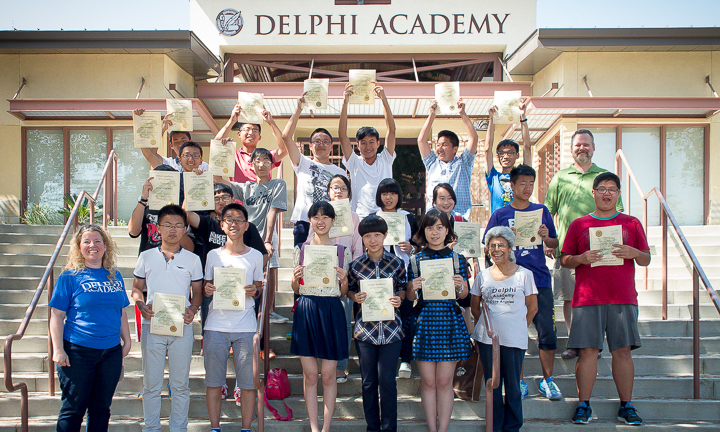 The Delphi Academy of Los Angeles provides a camp program for international students from around the world. This camp program focuses on immersing students in the English language through study and activities with the rest of the student body. International students are not an isolated group at Delphi; they participate in classes, workshops and fun activities with American students. We find this is the best way to make English a usable language. Except for the English Immersion class, International students spend their time with the American students, asking questions, discussing topics of interest, building friendships and developing their understanding of the English language. The Summer Camp Program is most beneficial when the student plans for a 4-week stay, but this can be modified based on the student’s travel plans. Because Camp students are not enrolled in our full academic program, they do not need to obtain an F-1 (student) visa, but they must at least travel on a tourist visa. The end goal is for International students to be living, breathing, talking and dreaming English by the end of four weeks. The cost for the 2017 Camp program was $510 per week and it will be raised a bit for the 2018 Summer Camp. An additional application fee of $100 is required. All payments are non-refundable. Summer Camp, March 15, 2018. Applications may be submitted after this time, and students will be admitted if space is available. The Summer Camp is offered from June 18, 2018 through August 17, 2018. A small number of host families are available. These are Delphi families and staff members who are able to have International students stay with them for the duration of the camp. Please be advised that Delphi Academy is not recommending or vouching for any of the referred host families. We provide the initial contact information so you may get in touch with the family if you desire. You or your hosting agency will be responsible for interviewing the local host family to determine if they will meet your needs. Host fees are paid directly to the host family – Delphi does not collect any host fees. Delphi Academy is not responsible for your child/children while in the care of a host family.